/ What Is The Best UV Sterilizer For Your Aquarium? In this article I will help you find the best UV sterilizer for your aquarium. This often overlooked piece of equipment can help you maintain a beautiful and healthy aquarium, free of algae and parasites. We will look at why it is important and then review some of the best and most popular models available. Some Of The Best UV Sterilizers 1. Coralife Turbo-T﻿wist UV Sterilizer 2. Aqua UV 15 Watt Advantage 2000+ 3. AA Aquarium Green Killing Machine Internal UV Sterilizer 4. Sun Microsystems In-Tank Submersible UV Sterilizer 5. Aqua Ultraviolet 25 Watt UV Sterilizer What Is The Best UV Sterilizer For Your Aquarium? An ultraviolet (UV) sterilizer is a filtration device that uses an ultraviolet light bulb to kill free floating microorganisms. Even the best maintained aquarium is home to many unseen parasites, bacteria and algae. By the time, these problem microorganisms are numerous enough to become apparent to the aquarist they have gained a strong foothold in the aquarium and are hard to remove without negatively impacting the aquarium’s general health. Using a UV sterilizer will help with these issues by genetically altering the microorganisms that pass through the device. The UV light shortens the life cycle of the microorganism thereby limiting their ability to reproduce and harm your aquarium. UV sterilizers have long been used by enthusiasts of saltwater aquariums but they can be equally useful for freshwater aquarists. UV sterilizers are traditionally an additional in-line device installed as the final piece of equipment in your filtration cycle. Many models require an independent water pump or a connection to the return hose of a canister filter. There are some models that are self powered as well as UV sterilizers that are free standing and are not tied into the rest of your filter system. Why Use A UV Sterilizer? UV sterilization can be a major asset in controlling unwanted algae growth and green water. Biological filtration, normal feeding and exposure to light all contribute to algae growth which cannot always be controlled with standard aquarium maintenance such as water changes. If you are encountering problem algae growth you should strongly consider the addition of a UV sterilizer to your filtration system. You may find that this device is the ideal solution to your algae problem and will eliminate your need for other algae control water treatments. Parasite control is another main use of UV sterilization. Parasites are inherent in any aquarium. They are introduced to the environment through the addition of new species and through water additions. In some cases harmless populations of parasites can increase to the level that they become problematic. Many of these parasites, such as ich, are invisible in early life stages and only become obvious to the aquarist when they have attacked a fish’s weakened immune system. At this point you need to resort to medications which can often impact the rest of your aquarium in undesired ways. Use of a UV sterilizer will help limit this kind of problem by destroying the parasites before they can impact your tank’s inhabitants. When used properly you can reduce parasite levels in your aquarium to those found in the wild. In this manner you can greatly reduce or eliminate the need to medicate your tank’s inhabitants. Another popular use of UV sterilizers is in outdoor ponds. Green water and free floating algae are often problems in outdoor fish ponds. UV sterilizers are very good at controlling this free floating algae and would be a great addition to your pond’s filtration system. Some caution needs to be taken when using UV sterilizers as they may remove some nutrients that your live plants require to thrive. These can also impact the effectiveness of medications so be careful before medicating a tank that employs a UV sterilizer. These issues can be controlled by using your UV sterilizer periodically to clear your water in a planted tank rather than having it run constantly. When medicating your tank you may need to turn off your sterilizer for a time to achieve your desired results. It is also not recommended that you use a UV sterilizer during your tank’s initial cycle as you want some good bacteria to flourish and the UV may negatively impact this bacterial growth. Adding a UV sterilizer to your aquarium’s filtration system will show benefits no matter what type of aquarium you maintain. The sterilizer needs to be properly sized regarding parameters such as flow rate, lamp wattage and exposure time. This refers to the amount of time that your water is exposed to the UV light. Recommendations are for a flow rate of approximately 20 gallons per hour flow per watt of UV light. When using an in-line model the UV sterilizer should be the final filtration device your water runs through before returning to the aquarium. This means installing it after all other mechanical and biological filtration devices. This allows the UV sterilization to have its greatest impact on your water quality after all large debris has been removed. Free standing sterilizers are also manufactured to allow independent placement by hanging or placing it in your tank and not having it attached to the main filtration system. Though perhaps not quite as efficient as an inline sterilizer, they still will provide benefits to your aquarium and allow for more flexibility in placement and usage. This style of UV sterilizer is great to have available for temporary use when faced with a disease or algae outbreak. It is also ideal for those who want to use UV sterilization intermittently rather than constantly. Some planted tanks benefit from this type of usage. Proper maintenance of the device is relatively simple but key to its effectiveness. Sterilizers require regular cleaning of the quartz sleeve that houses the bulb. Replacing the bulb regularly is equally important in keeping the UV sterilizer operating at peak efficiency. A weak or older underpowered bulb will degrade performance and you will not obtain your desired results. Here are some of best UV sterilizers currently available. This sterilizer can be used in both fresh and saltwater tanks and comes in a variety of sizes that can handle large aquariums up to 500 gallons in size. This unit is easy to install, is user friendly and has a unique turbo-twist design that forces the water to pass by the UV bulb 3 to 12 times before leaving the unit leading to increased efficiency. The turbo-twist is a versatile unit that comes with brackets so it can be hung on your tank and can also be used as an inline sterilizer in conjunction with the rest of your filtration system. It has a powerful 36 watt UV bulb which does a great job of killing organisms and algae and has a very durable quartz case. This video shows its algae killing power in action. This is an excellent choice for your UV sterilization needs. This sterilizer is great for small and medium tanks. It is rated for 200 gallons of freshwater or 70 gallons of saltwater aquarium capacity and can be used both indoors and outdoors. 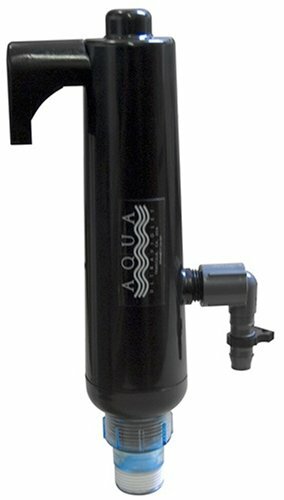 The sterilizer is an inline device that works best connected to the return hose from a canister filter or a separate water pump. Its most unique feature is that the unit hangs off the back of the tank, saving room inside the tank for your fish. A clear quartz cap shows a glow when the long lasting lamp is active. Easy to install and maintain, it does an excellent job of controlling algae and parasites and will contribute to your aquarium having crystal clear water. The AA Aquarium Green Killing Machine is an excellent UV sterilizer with models available for use in aquariums up to 50 gallons. It is fully submersible and easy to set up without tools. The included mounting suction cups allow you to hide the unit behind other aquarium decor. It uses a patented technology that allows water to come in direct contact with the UV light allowing the machine to get by with a 9 watt bulb. This sterilizer can be clipped onto any waterfall type filter expanding its versatility. Another nice feature of these sterilizers is that they have an LED indicator that alerts you to the need for a bulb change. The mini model pictured below is designed for use in tanks up to 20 gallons, so even small aquariums can benefit from UV sterilization. Its name is well earned as it is an excellent antidote for problem algae and green water as seen in this video. Here is another submersible sterilizer that has some unique features. It works for salt and freshwater tanks up to 55 gallons. An economical feature of this sterilizer is that a water pump is built into the unit saving the cost of that additional piece of equipment. Its self contained design allows for easy installation. If you have multiple tanks this may be a great choice as you can use it sequentially in multiple tanks giving each a good cleaning before moving on to the next one. Using the included suction cups it can be mounted either horizontally or vertically to the inside of your tank. It also has a filter sponge to remove more debris before the water gets to the UV light. The unit does produce powerful suction so care must be taken if you keep snails or very small creatures in your aquarium. If you are breeding livebearers this sterilizer is probably not the best choice, but for all other aquarium applications it is an excellent option. 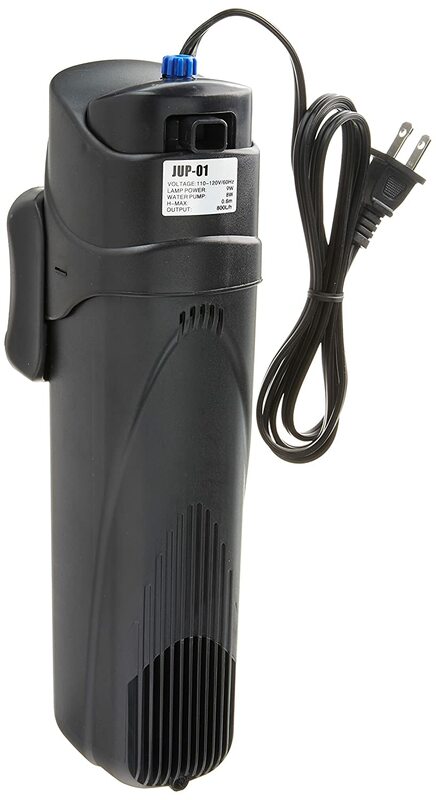 It is a compact, inexpensive unit that will do a great job of keeping your aquarium’s water clear and clean. This is a versatile UV sterilizer that is designed to service large tanks. It can handle freshwater environments up to 1200 gallons and saltwater aquariums up to 150 gallons in size. Its indoor-outdoor construction and flow capacity also makes it a great choice to clear your pond’s water. This unit is available in black and white to complement your aquascape’s decor. It is simple to install with an optional twist body design to allow installation flexibility. It is also designed to allow for easy bulb and quartz sleeve maintenance. The company’s website even has installation videos available. This unit is manufactured to create maximum flow rates and achieves 99.9% UV transmission rates. It also boasts an industry best bulb life of up to 14 months. Using this sterilizer your tank’s water will be clean in 3-5 days and will remain crystal clear. All of these UV sterilizers are very good and will perform well for you. Certain factors such as space constraints or finances may lead you to choose one over the others for its unique characteristics or its price. If space and cost are not constraints then I would recommend the Coralife Turbo-twist UV sterilizer as the best available. Its 3 models are sized to suit most aquariums. The most powerful contains a very strong 36 watt UV lamp. The versatility of its mounting options give the aquarist freedom to use this unit in a variety of ways that can complement your current filtration system. The Turbo-twist is easy to set up and install and will quickly cure your tank’s problems. 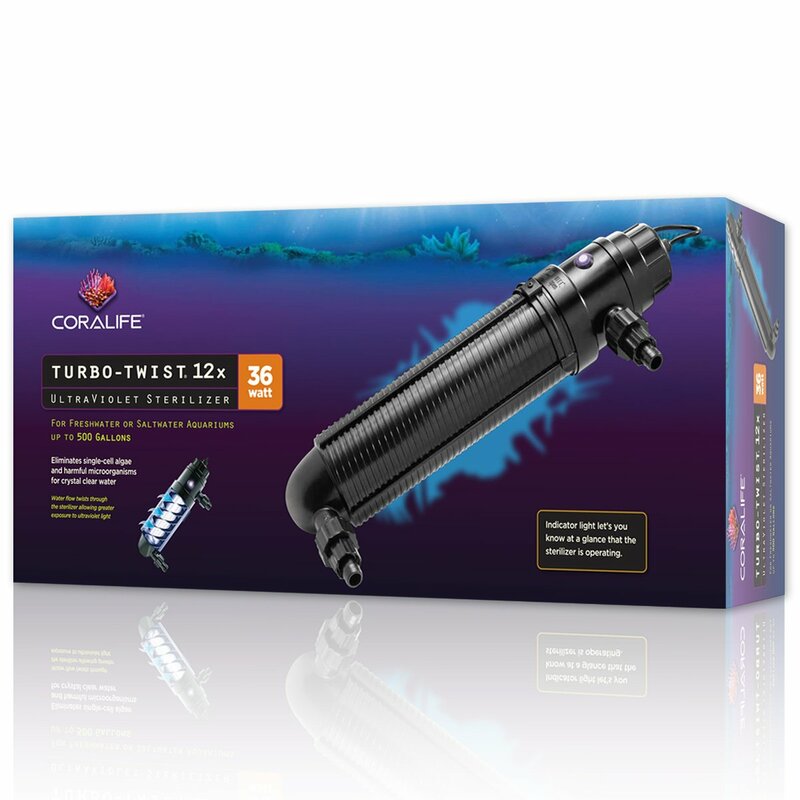 I believe that the turbo-twist technology which exposes the water to the UV light repeatedly improves its efficiency and is a major step forward in aquarium sterilizers. Its demonstrated ability to eliminate green cloudy water and control parasites and diseases such as ich make it a great choice for any aquarist. I would feel very confident in purchasing this unit for my own aquarium.